Frame #1: The left arm is just entering the water. The right arm is in the latter part of its propulsive phase and is demonstrating the "inward-upward scull" motion displayed by other top backstrokers. This action is swift and does produce force that will maintain propulsion. The vertical force component of the right arm would cause the body to roll if the left leg did not kick to counter-balance that possibility. The streamlined alignment of the swimmer is very noticeable. Frame #2: The left leg continues to kick as the right-arm inward-upward scull is performed. The right leg is dropping and bending at the knee preparatory to kicking. The left arm is still straight but the wrist is flexed and abducted as an orienting action to prepare to apply force backward. It is stretched well forward and demonstrates what could be considered to be a position of maximal length forward. Torso and hip streamline is maintained. Frame #3: The left arm bends slightly at the elbow, the abducted angle of the hand is reduced, and the hand is oriented partly toward the pool bottom. The right leg begins to kick to counter-balance the vertical force component of the left arm movement. The left leg kick is completed as the sculling right arm exits the water. The left leg kick also promotes hip roll to the left. Frame #4: The orientation of the propelling left arm is now backward. The right leg kick is decelerating even though it will travel further before completion. The shoulders have rolled to their maximum angle. The recovering arm is at its peak height. The left leg is sinking preparatory to kicking. Frame #5: A rapid bending of the right arm elbow rotates the right hand upward toward the surface. The right leg completes its kick while the left leg is being positioned to kick. The amount of shoulder roll has reached its maximum and at this stage is starting to rotate in the other direction mainly to accommodate the recovering right arm. Frame #6: The marked elbow bend in the left arm is clearly shown. The left leg begins to kick to counter balance the downward vertical force being created by the left arm action. The swimmer glances to the left. Shoulder depth has been reduced. Frame #7: The propulsive left arm is rapidly extended and, as a consequence, the left leg kicks. The right leg drops down and bends at the knee preparatory to kicking to counter-balance the vertical forces created by left arm extraction. The left arm pulling-pattern is the traditional press back and down action, which is indicative of an "S-shaped" path. The hips are level and the shoulders approach being level. Frame #8: The right arm is entering the water causing the shoulders to be level. The right leg kicks to counter-balance the final thrust of the left arm downward push. The right leg kick also promotes hip rotation to the right. This position does not seem to be as "stretched" forward as that demonstrated with the left arm entry in frames #1 and #15. Frame #9: The left arm begins to exit the water. This movement is initiated by raising the left shoulder, which rotates the shoulders and, in turn, drops the right shoulder down into a position that will facilitate developing propulsion. Although it is difficult to see in this frame, the left leg is dropping and bending at the knee preparatory to kicking. Frame #10: The right arm sweeps down and out with only a small amount of bend at the elbow. It is possible that this "delayed" bending of the arm is caused by having to wait for the left arm to exit. The right leg kicks which causes the hips to drop further to the right. The left leg bends preparatory to kicking. The head is well back and down in the water. Frame #11: The right arm starts to bend at the elbow while adduction of the upper arm occurs. Propulsion at this stage is primarily backward. The bubbles trailing the right hand indicate that its speed is increasing. The right leg completes its kick and the left leg is well down ready to kick. Frame #12: Adduction of the upper right arm and bending at the elbow, which thrusts the hand upward, is counter-balanced by a left leg kick. The right leg is lowered preparatory to kicking. The recovering left arm is past vertical and causes the shoulders to rotate toward being level. Frame #13: The right hand sweep remains wide and goes deeper as extension of the arm occurs. It is being positioned so that an inward and upward scull can be executed as the arm is extracted after direct propulsion ceases. The left leg kicks to balance the forces created by shoulder rotation and the vertical force component in the downward push of the right arm. Frame #14: The deep and wide right arm push continues. The left arm is approaching entry. The right leg kicks to counter-balance continuing rotational and vertical forces created by the recovering arm and the wide sweeping right hand/forearm. Frame #15: This position is almost identical to frame #1 and the sequence of movements commences again. 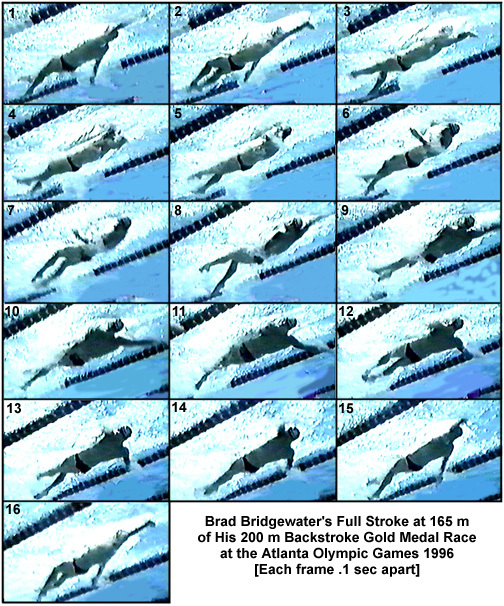 Brad Bridgewater's stroke is one that has a different form for each arm. The right arm sweeps wide and deep and exits using an inward and upward sculling movement. That results in propulsion being maintained for almost the entire stroke. The left-arm movement pattern is very traditional. It follows an S-shaped path finishing with the hand deep in the water when propulsion is completed. The left arm extraction creates only resistance and consequently, that phase of the stroke is not as efficient as that of the right arm. The legs kick continuously throughout the action. One has to ponder if the legs are reacting to balance arm movements or whether the arms are reacting to counter-balance the kicks. The swimmer's streamlining throughout the whole stroking sequence is excellent. When streamline is added to the maximum stretch of the left arm entry and acceptable stretch of the right arm, the whole swimmer's "system" appears to be well positioned for economical progression through the water.